Plumage of the adult is warm and pale brown overall, giving the bird a "dull, plain-faced" appearance (Vickery 1983). The deep brown wing coverts and short tail are barred, the flanks are buff-orange, the chin, throat and center belly are dull white, and the undertail coverts are plain buff. The crown is "finely, somewhat obscurely, streaked with tan and dark brown" (Vickery 1983), and the tail is typically cocked over the back. The sexes have similar plumages, with males about a gram heavier than females (species weight ranges from 7 to 10 grams) (Taylor et al. 1983, Herkert et al. 2001). Juveniles are similar to adults except that the streaking is less conspicuous on the head and neck and more conspicuous on the back, with more of a buff coloration on the throat and abdomen than the adults (Forbush 1929, Walkinshaw 1935). The song of males is a dry, staccato chattering "chap chap chap chapper-rrrrr" (Peterson 1980). Among individuals, the song's introduction is stereotyped, whereas the trill is highly variable (Kroodsma and Verner 1978). The call note is "churr churr," "chap churr," or "chap" (Bent 1948, Peterson 1980). Sedge Wrens frequently sing at night (Vickery 1983). In contrast to the Marsh Wren (Cistothorus palustris), the other wren to occur primarily in wetlands, the Sedge Wren lacks a distinct white stripe over the eye, is lighter-colored, and has a shorter bill (Vickery 1983). The Sedge Wren's streaked crown, smaller size, and distinctive song distinguish it from the House Wren (Tryglodytes aedon) (Herkert et.al 2001). The migratory pattern of this species in Montana is poorly known, and few records exist for the state. 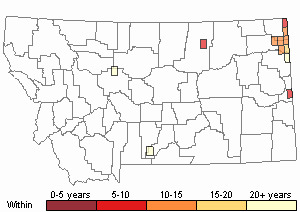 The earliest recorded date for Sedge Wren in Montana occurred in April 1909 in Gallatin County. 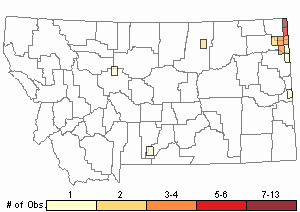 Two recent records for Westby and Fort Peck indicate the presence of individuals in May (Montana Bird Distribution Committee 2012). In 1979, a Sedge Wren was observed in Great Falls during the third week in September, the latest season date for the species in the state (Wright 1996, Montana Bird Distribution Committee 2012). No specific information exists, but appropriate wetland habitat is present in the areas of the state in which the species has been recorded. No food habits data are available for Montana, but other studies indicate Sedge Wren diet consists mainly of spiders and insects. Ants, bugs, weevils, ladybird beetles, moths, caterpillars, locusts, crickets, and grasshoppers are, at times, also included (Howell 1932, Terres 1980). Prey is picked from the ground or from foliage. Walkinshaw (1935) observed the birds feeding their young moths, spiders, mosquitoes, flies, grasshoppers, and bugs. The "mouse-like," inconspicuous feeding behavior suggests that these birds forage mainly at ground level, probably for insects hiding in moist soil and among bases of sedges and grasses (Howell 1932, Walkinshaw 1935). Sedge Wrens are adapted to foraging in shrubby grasslands, owing to their small size, relatively long bills, and longer legs in comparison to other wren species using forested habitats (Niemi 1985). Abundant insect food in upland habitats, probably a function of rainfall, soil moisture, and productivity of adjacent marshlands, often attracts Sedge Wrens to feed away from wetland habitat (Orians 1980). 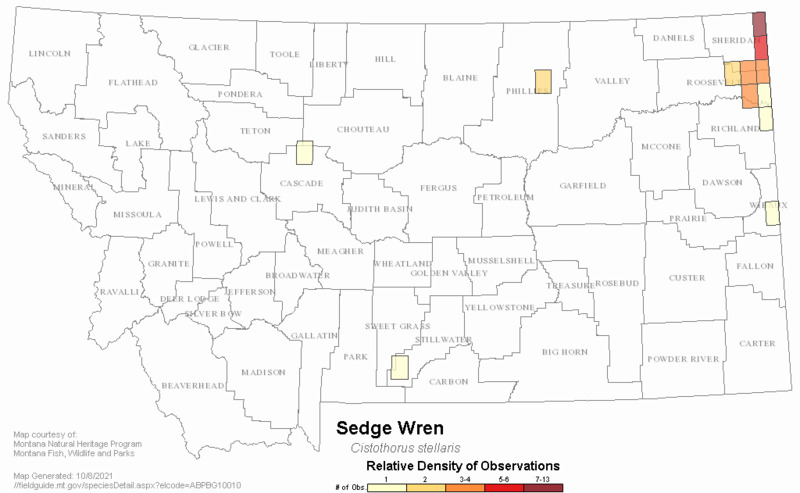 No information is currently present regarding Sedge Wren ecology in Montana. It is known from other studies of Sedge Wren ecology that grazing has a negative effect on their ability to find appropriate habitat and the densities of nesting males decrease as areas are grazed (Walkinshaw 1935, Stewart and Robbins 1958, Cink and Sepahi 1983, Birkenholz 1984, Higgins et al. 1984, Hanowski and Niemi 1986, Manci and Rusch 1988, Lingle and Bedell 1989). Sedge Wrens may destroy the eggs of other Sedge Wrens or other small birds. The average size of a Sedge Wren's nesting territory is about 0.2 hectare (Byrd and Johnston 1991). Estimates of territory size for five males in Minnesota averaged 1,280 meters squared (Burns 1982). Preferred habitat are areas that are highly susceptible to flooding and drying caused by annual and seasonal variation in rainfall. Because their preferred habitat is so influenced by seasonal and annual changes in moisture, Sedge Wrens are relatively mobile in their selection of nesting sites and may be totally absent in some years from regions in which they previously nested (Kroodsma and Verner 1978, Cody 1985). Vegetative succession and disturbance by grazing, haying, and planting also impart a highly transitory character to nesting habitats. 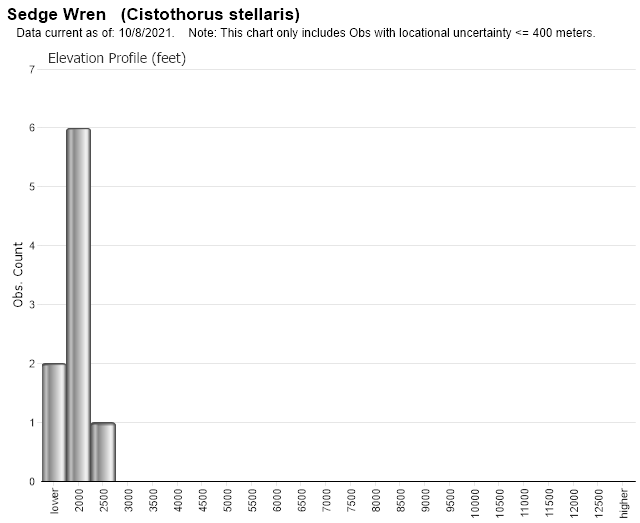 This habitat instability may lead to the high mobility and low site tenacity of Sedge Wrens (Kroodsma and Verner 1978). The complete regional absence in some years, however, suggests that some factor in addition to habitat instability is involved in population fluctuations, perhaps regional patterns of rainfall or weather conditions during migration. The nature of the communication system as a unique adaptation to high population mobility (Kroodsma and Verner 1978) suggests that opportunistic breeding and low site tenacity has occurred for a long time, rather than being of recent origin, such as in response to agriculture and habitat loss (Burns 1982). These birds are "curiously local" and occur sporadically within the Andean Zone of South America, and there is no reason to believe that anthropogenic factors influence the species' distribution there (Fjeldsa 1988). Information on species reproduction is unavailable for the state as no records exist containing direct evidence of breeding. 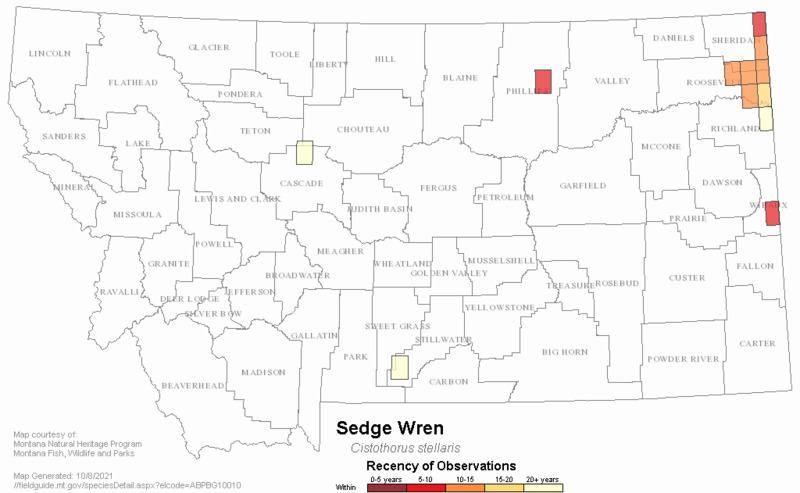 A territorial pair was observed and recorded in Westby in 1988 and 1996 (Wright 1996), and behavior observed on several other occasions in Westby and Medicine Lake suggests breeding (Wright 1996, Montana Bird Distribution Committee 2012). Reproduction information from studies elsewhere record nests of Sedge Wrens being well-hidden, rounded balls made of woven, fine grasses and culms of sedges, typically with a single side entrance. They are often built near the ground (less than 0.5 m) and are attached to live stems of grasses and sedges (Walkinshaw 1935, Tordoff and Young 1951, Harrison 1987). Sedge Wren eggs are ovate or pointed-ovate, white and unmarked, smooth and moderately glossy (Harrison 1987), and measure approximately 16 by 12 mm (Bent 1948). Nesting phenology may be related to site latitude and often occurs in two "waves" during a given season. Sedge Wrens arrive at nesting areas as early as mid-April (Bent 1948) in some regions or as late as July in others (Lingle and Bedell 1989), and have been observed nesting as late as the end of September (Schwilling 1982). Nesting in many northeastern states, especially in the more northerly latitudes, may be initiated from May to June, but may not occur until as late as July (Lingle and Bedell 1989). Late nesting at certain sites could represent renesting attempts by birds arriving from elsewhere or could be an adaptive response of local birds to delayed availability of moist, but unflooded, grassland habitats. Peak nesting populations in mixed-grass prairie in North Dakota occurred after unusually wet springs, but nesting activity showed little response to spring temperature (Cody 1985). Occupancy of a given site varies among years, and sites used one year may be abandoned the next (Palmer 1949, Burns 1982). Upon arrival at nesting areas, males establish territories for courtship, nesting, and foraging (Burns 1982). Territory boundaries are fluid throughout the nesting season, and males may shift their activity and defend new areas as the season progresses. Males defend territories and attract mates by singing vigorously throughout the breeding season, as much as 22 h/day and at rates of up to 12 to 15 songs per minute (Walkinshaw 1935, Kroodsma and Verner 1978). This combination of song components may permit mixing of highly dispersive populations (Kroodsma and Verner 1978) and may represent an evolutionary compromise between species identification and sexual selection among individuals. Because local dialects would be swamped in such highly mobile populations, neighboring males do not share song-type repertoires nor do they counter-sing by matching song-types, as does Marsh Wren. Males build multiple, domed nests that figure prominently in courtship, and may also serve as dormitories and decoys for predators (Verner 1965, Picman and Picman 1980, Burns 1982). In Minnesota, males built an average of 7.4 complete nests and 0.8 incomplete nests on each territory (Burns 1982). Nests used for incubating eggs are built closer to the ground than dummy nests and have a substantial inner lining of grass, sedge, and feathers added by the female (Walkinshaw 1935, Burns 1982). Females begin laying one egg daily about the third day of nest lining (Burns 1982), and initiate incubation before the clutch is complete. Usually 7 eggs are laid per clutch (range is 2 to 8), although clutches laid later in the season may be smaller (Bent 1948, Harrison 1978, Burns 1982). A clutch of 4 eggs is average in Costa Rica (Stiles and Skutch 2003). Incubation is by the female only and lasts about 14 days (Burns 1982). Females in some populations are double-brooded, but are single-brooded in others (Walkinshaw 1935, Crawford 1977, Burns 1982). Males may be serially or simultaneously polygynous and females may be serially polyandrous (Crawford 1977, Burns 1982). Mates of monogamous males had higher reproductive success than both primary and secondary females mated with polygynous males, whereas polygynous males had higher reproductive success than monogamous males (Burns 1982). Nest success (nests with at least one egg hatching) was reported at 68% (n = 31 nests, Crawford 1977) and 69% (n = 18 nests, Burns 1982). Sources of nest loss include predation, infertile clutches, heavy rains, trampling by grazing cattle, and nest destruction by other Sedge Wrens (Walkinshaw 1935, Crawford 1977, Picman and Picman 1980, Burns 1982). The nestling period lasts 13 to 14 days (Walkinshaw 1935, Crawford 1977). Fledging success (number of young fledged per number of eggs laid) has been reported at 0.67 in Minnesota (Burns 1982). The female provides virtually all parental care of nestlings, although males occasionally feed nestlings (Walkinshaw 1935, Burns 1982). Nest-building and continual defense by males of territories with abundant food may compensate females for a lack of male parental care of offspring. Fledglings move about in small groups until migration occurs (Gibbs and Melvin 1992). 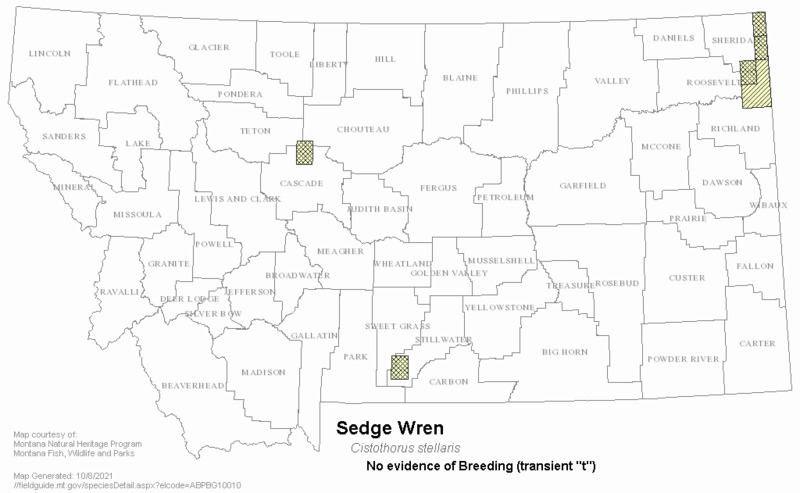 No known active management is ongoing for Sedge Wren in the state. 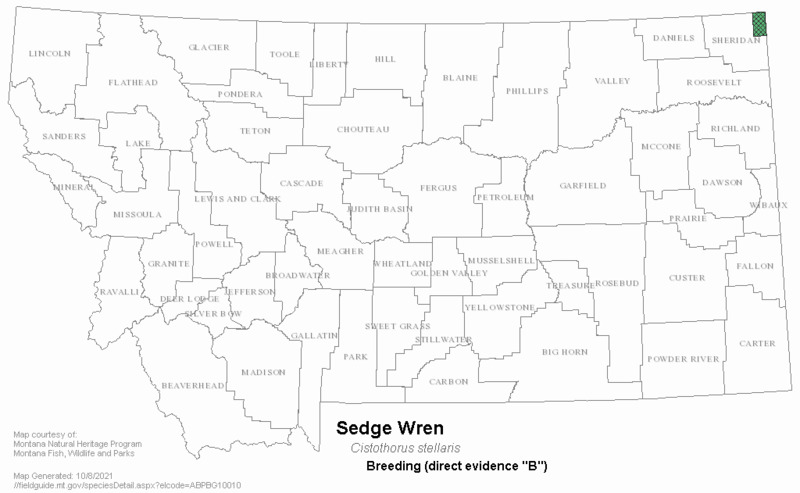 Sedge Wrens are a Species of Management Concern in U.S. 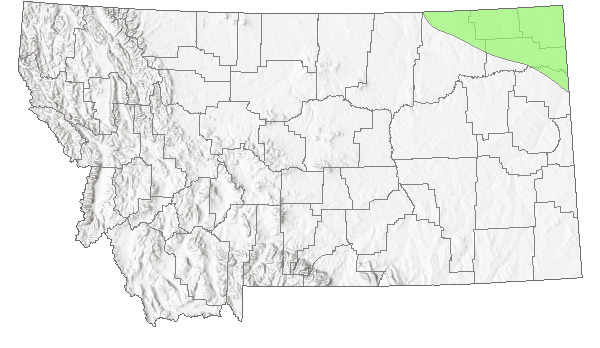 Fish and Wildlife Service Region 6 (USFWS 1995). Bent, A. C. 1948. Life histories of North American nuthatches, wrens, thrashers, and their allies. U.S. National Museum Bulletin No. 195. Burns, J.T. 1982. Nests, territories, and reproduction of sedge wrens (Cistothorus platensis). Wilson Bulletin 94(3):338- 349. Byrd, M.A. and D.W. Johnston. 1991. Birds. In: K. Terwilliger, coord. Virginia's endangered species: proceedings of a symposium. p. 477-537. McDonald and Woodward Publishing Company, Blacksburg, Virginia. Cink, C. and P. Sepahi. 1983. Floodplain tall grass prairie. American Birds 37:83. Cody, M. L. 1985. Habitat selection in grassland and open-country birds. In: M. L. Cody ed. p. 191-226. Habitat selection in birds. Academic Press, Orlando, Florida. 558 pp. Fjeldsa, J. 1988. Status of birds in steppe habitats of the Andean Zone and Patagonia. In: P.D. Goriup, ed. p. 81-95. International Council for Bird Preservation Technical Publication Number 7. 250 pp. Forbush, E. H. 1929. Birds of Massachusetts and other New England states. 3 volumes. Massachusetts Department of Agriculture, Boston. Gibbs, J. P. and S. M. Melvin. 1992. Sedge wren, Cistothorus platensis. In: K. J. Schneider and D. M. Pence, eds. Migratory nongame birds of management concern in the Northeast. p. 191-209 U.S. Fish and Wildlife Service, Newton Corner, Massachusetts. 400 pp. Hanowski, J. M. and G. J. Niemi. 1986. Habitat characteristics for bird species of special concern. Minnesota Department of Natural Resources, St. Paul, Minnesota. Unpublished report. Higgins, K. F., T. W. Arnold, and R. M. Barta. 1984. Breeding bird community colonization of sown stands of native grasses in North Dakota. Prairie Naturalist 16:177-182. Howell, A. H. 1932. Florida bird life. Coward-McCann, New York. 579 pp. Lingle, G.R. and P.A. Bedell. 1989. 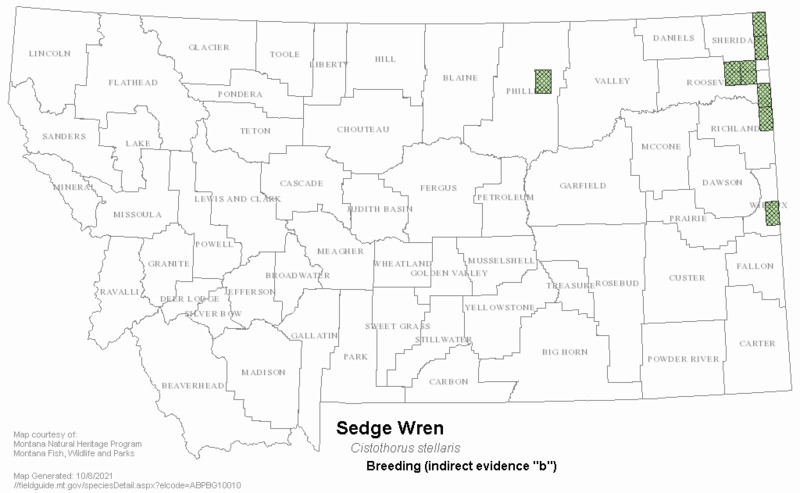 Nesting ecology of sedge wrens in Hall County, Nebraska. Nebraska Bird Review 56:47-49. Manci, K. M. and D. H. Rusch. 1988. Indices to distribution and abundance of some inconspicuous waterbirds at Horicon Marsh. Journal of Field Ornithology 59:67-75. Orians, G. H. 1980. Some adaptations of marsh-nesting blackbirds. Princeton University Press. 295 pp. Picman, J. and A.K. Picman. 1980. Destruction of nests by the short-billed marsh wren. Condor 82:176-179. Stewart, R. E. and C. S. Robbins. 1958. Birds of Maryland and the District of Columbia. North American Fauna Number 62. U.S. Government Printing Office, Washington, D.C.
Tordoff, H. B. and G. P. Young. 1951. Short-billed marsh wren breeding in Kansas. Wilson Bulletin 63:44. Vickery, P. 1983. Sedge wren. In: J. Farrand, ed. The Audubon Society master guide to birding, Volume 2:352-354. Alfred A. Knopf, New York, New York. 398 pp. Bent, A. C. 1949. Life histories of North American thrushes, kinglets, and their allies. U.S. National Museum Bulletin No. 196. 452 p.
Crawford, R. L. 1981. Bird kills at a lighted man-made structure: often on nights close to a full moon. Am. Birds 35(6):913-914. Gaines, E.P. and M.R. Ryan. 1988. Piping plover habitat use and reproductive success in North Dakota. The Journal of Wildlife Management 52(2): 266-273. Web Search Engines for Articles on "Sedge Wren"